Overnight China released its latest monthly credit data which showed that even as China is trying to choke off its shadow banking sector, something we showed most recently last month when we discussed the biggest crash in net bond issuance on record, credit to the broader economy continues to flow, although it comes as M2 crashed to a new all time low and has prompted some nervous analysts to say that even this “crazy” loan creation number may not be enough. 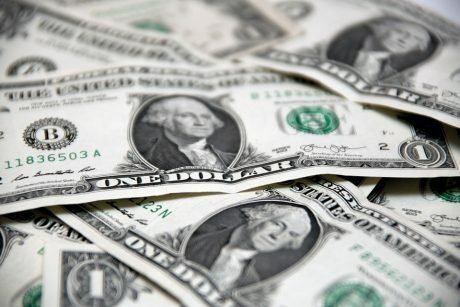 The details: in June Chinese banks extended 1.54 trillion yuan ($226.9 billion) in net new yuan loans, well above analysts’ expectations of 1.2 trillion yuan, and up from 1.11 trillion in May (which was also higher than the 1 trillion expected). Outstanding yuan loans grew by 12.9%, unchanged from a month ago, and more than the forecast 12.7% increase. Household loans, mostly mortgages, rose to 738.4 billion yuan in June from 610.6 billion yuan in May; these accounted for 48% of total new loans last month, down from 55% in May. This post was published at Zero Hedge on Jul 12, 2017. Did you know that the federal government is going to spend more than 4 trillion dollars this year? To put that into perspective, U. S. GDP for the entire year of 2017 is going to be somewhere between 18 and 19 trillion dollars. So when you are talking about 4 trillion dollars you are talking about a huge chunk of our economy. But of course the federal government doesn’t bring in 4 trillion dollars a year. At the beginning of Barack Obama’s first term, we were 10.6 trillion dollars in debt, and now we are nearly 20 trillion dollars in debt. That means that we have been adding more than a trillion dollars a year to the national debt. When you break that down, that means that we have essentially been stealing more than a hundred million dollars from future generations of Americans every single hour of every single day to pay for our debt-fueled lifestyle. Even Federal Reserve Chair Janet Yellen is warning that this is not sustainable, and yet we just keep on doing it. This post was published at The Economic Collapse Blog on July 12th, 2017. Not a single word of the ad is in Catalan or Spanish, the two official local languages. Everything is in English. These properties are not meant for local people – that’s not where the money is. The money is in the international market, whose insatiable demand for real estate in this increasingly popular global city has propelled property prices to bubblicious levels. In the last 12 months in Barcelona, the median home price (half are higher and half are lower) has soared 21.7%, to 3,094 per square meter (ca. $350 per square foot), with double-digit increases across all of the city’s districts, according to data compiled by the property appraiser Tinsa. The biggest movements were seen in the city’s old town, which is ground zero for the city’s tourist industry. There the median price have skyrocketed 35% in just one year. This post was published at Wolf Street by Don Quijones – Jul 12, 2017. For millions of Americans, Social Security is their livelihood. Over 66 million people receive Social Security – that’s 20% of the U. S. population. A whopping one-third of these beneficiaries rely on Social Security for at least 90% of their income. What’s more, for 61% of all beneficiaries, Social Security is at least half of their income. Odds are that, if it isn’t already, Social Security will be a major part of your income one day. That means it’s important to know where that money comes from, how it’s distributed, and how long you can expect to receive it. This post was published at Wall Street Examiner by Cooper Creagan ‘ July 12, 2017. ‘We’re focused on putting cash out of business,’ Visa’s new CEO Al Kelly said on June 22 at Visa Investor Day. Pushing consumers into digital and electronic payments is the company’s ‘number-one growth lever.’ Visa has been dogged by the stubborn survival of cash and checks, despite widespread government and corporate efforts to kill them off. Globally, check and cash transactions totaled $17 trillion in 2016, Visa President Ryan McInerney said. Confusingly, that’s up 2% from a year earlier. So today, Visa rolled out a new initiative on its war on cash. It’s designed ‘for small business restaurants, cafs, or food truck owners,’ and the like. In this trial, it will award up to $10,000 each to 50 eligible businesses (online businesses are excluded) when they commit to refusing cash payments. Going ‘100% cashless,’ as Visa calls it, means that consumers can only pay with debit or credit cards or with their smartphones. This post was published at Wolf Street by Wolf Richter ‘ Jul 12, 2017. The Gold Direction Indicator just turned Green! For the benefit of subscribers and to help yours truly to make good decisions, we plot an indicator with ten components on a daily basis, that we refer to as the GDI. On Monday the GDI closed at 39% and on Tuesday it moved into positive territory with a reading at 61%. Charts courtesy Stockcharts.com unless indicated. As the following chart (courtesy goldchartsrus.com) shows, the long-term historical pattern (black line), is for gold and mining stocks to rise for 8 months, once the June-July lows are put in place. 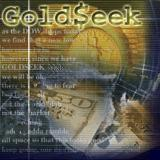 This post was published at GoldSeek on 12 July 2017. Another day, another British bank fined billions of dollars for its past-life transgressions. Moments ago Royal Bank of Scotland announced it has agreed to pay $5.5 billion to the U. S. Federal Housing Finance Agency to settle a probe into its sale of toxic mortgage-backed securities ahead of the financial crisis, part of what it says was a ‘heavy price’ paid for over-expansion before the financial crisis. The settlement targets $32 billion in debt issued by housing agencies Fannie Mae and Freddie Mac. “This settlement is a stark reminder of what happened to this bank before the financial crisis, and the heavy price paid for its pursuit of global ambitions” said RBS CEO Ross McEwan, adding that it was an ‘important step forward in resolving one of the most significant legacy matters facing RBS’. There was some good news: RBS is eligible for a $754 million reimbursement under indemnification agreements with third parties. While this is great news for AMZN stock, which is clearly higher on the news, it is bad news for the rest of the retail sector – especially bricks and mortar – which continues to drift ever further away from the online shopping craze, especially when substantial discounts are factored in to those who are already locked inside the Amazon “ec(h)osystem”. Heading into today’s meeting with a smorgasbord of ‘relatively’ good data recently, Governor Poloz had the perfect excuse to raise rates (for the first time since 2010) and tamp down the firey bubble in home prices. Not a total surprise, given hawkish comments from BOC officials in recent weeks, but the Loonie is surging on the hike but CAD stocks (which were rallying into the decision) are limping lower. The Bank of Canada raised interest rates for the first time since 2010, citing a recent acceleration of growth that it predicts will eliminate fully the economy’s economic slack by the end of this year. The Dow Jones Industrial Average hit a new record high after U. S. Federal Reserve Chair Janet Yellen offered a dovish testimony before the House Financial Services Committee. This post was published at Wall Street Examiner on July 12, 2017. NY PRICING AT THE EXACT SAME TIME. $1220.60 ???? This post was published at Harvey Organ Blog on July 12, 2017. Seattle has done one thing effectively: drive out earners. 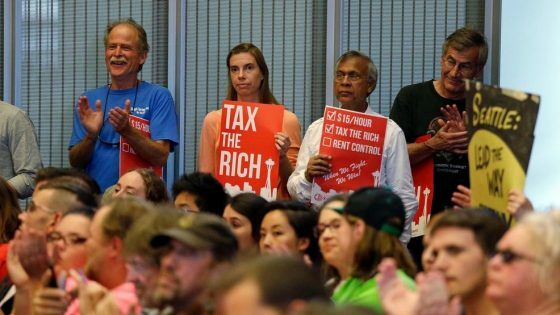 Anyone making over $250,000 within city limits of Seattle is now subject to a new income tax, but the new law is likely to face a court battle over its unconstitutionality. The cheers from the socialists as this blatant constitutional violation was on full display was possibly the most horrific part of the entire debacle. People are actually cheering and happy that the government is stealing money from those they don’t even know. It’s like humanity has never existed. To make matters worse, the tax isn’t even constitutional, let alone legal. Washington state’s own constitution clearly says that an income tax, especially a ‘progressive’ one, enacted as a punishment for success, is a constitutional violation, but politicians have never cared about the constitutionality of the laws they enact. This post was published at The Daily Sheeple on JULY 12, 2017.
Who could have seen this coming? US mortage applications tumbled 7.4% in the prior week – the biggest drop since 2016 – as mortgage rates rose to two-month highs following the Fed’s rate-hike and hawkish jawboning. The Dow plunged 508 points that hell-mouth day – an unthinkable 22%. A similar stock market event today would spell a 4,724-point cataclysm. We liken that October day in 1987 to the ancient Battle of Cannae… when invincible Rome lost as many as 70,000 legionnaires to Hannibal’s armies – in a single day. Or July 1, 1916, the first day of the Battle of the Somme, when nearly 20,000 British soldiers fell before the German guns… and never got up. What could lead today’s market to its own Cannae, its own Somme… another Black Monday? Today we set aside our renowned optimism… enter into the spirit of doom… and consider one possibility. Bassman’s taken the current market and put it under his microscope. Fed Chair Janet Yellen’s prepared remarks confirm her previous stance that they will keep normalizing their policy stance (no matter what), bringing forward the timeline for unwinding the balance sheet, and adding that “rates won’t have to rise much further to get to neutral.” This seems like a ‘dovish’ tilt, and judging by the reaction in stocks (higher) and the dollar (lower) it agrees. Because the neutral rate is currently quite low by historical standards, the federal funds rate would not have to rise all that much further to get to a neutral policy stance. because we also anticipate that the factors that are currently holding down the neutral rate will diminish somewhat over time, additional gradual rate hikes are likely to be appropriate over the next few years to sustain the economic expansion and return inflation to our 2 percent goal. Even so, the Committee continues to anticipate that the longer-run neutral level of the federal funds rate is likely to remain below levels that prevailed in previous decades. First published on Sat July 8 for members: As I see many metals investors and traders begin to throw in the towel, I wanted to take this opportunity to again explain why I will not count myself amongst them just yet. However, I will explain below what it would take to have me begin to look for lower lows in the overall complex relative to 2015, since I have been asked so often. (And, I usually get those questions as the market bottoms and begins a strong rally). While the market did not follow through on the immediate bullish set up I outlined over the last several weeks, it does not invalidate the larger degree perspective we still see in the market. And as sentiment becomes more and more bearish, there are many more signs that a strong rally is setting up to take hold. But, again, even though the smaller degree immediate bullish set up invalidated, and we will have to await the next one to set up, I think that anyone aggressively maintaining on the short side of the market will likely overstay their welcome. Let’s start with the larger degree structures. Back in 2015, the greater probabilities suggested that the metals complex completed its long term ‘pullback,’ right into the zone we were targeting for a long-term bottom. That is why I was suggesting our members enter their long-term positions at the end of 2015, and it was also why we began our EWT Miners Portfolio at that time. Hawkish? Dovish? Balance sheet reductionist? Rate-hike limited? Worried about inflation or excited by the economic outlook? Or just plain old confused? What and why did Yellen just say what she did, unleashing the latest market reaction to her supposedly “dovish” congressional testimony, and sending risk assets higher just two weeks after the same Janet Yellen warned about frothy market valuations?